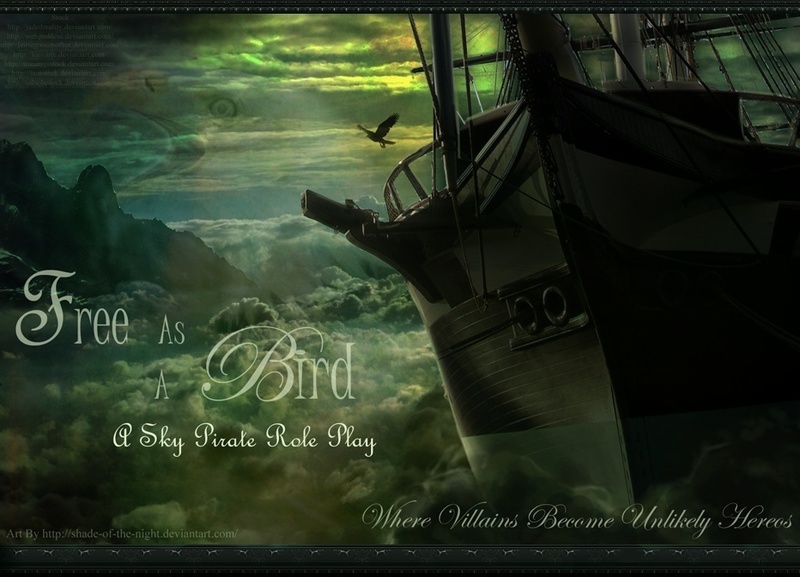 Hello and welcome to Free As A Bird, a semi-literate Sky-Pirate role play here villains are made into unlikely heroes. Our FAQ board has been created! Here is where our plot, rules, etc. can be found. Please read everything inside. News, Prize Shop, graphics, games chatter and more can be found within. The ship modifications board is where you can ask for weapons or other such modifications to add to your ship, making it more powerful or efficient. A staff member will add things to your ship's board after it has been requested on here. Suggest new items for the the list in the Question and Suggestions board. This is a place where you can ask questions or make suggestions for the site. Who knows we might even take it to heart and change something because of you. Guest Friendly! Here members can trade, sell, and buy items from each other. Items that you have acquired on a hunt or bought can be sold, make a thread listing the items you are willing to sell or what you will trade for them, or comment on an existing thread to buy items from other people. Rare items can been found here so be sure to keep an eye on the threads you never know what kind of deal you'll find. Here is where the character applications are. Before your character is accepted into the site you first must post it up here for mods and admins to view. Here members can post logs to keep track of their characters. The capitol of Sterhera located in the heart of the city it is the largest of Argo's cities. Built from the white stone quarried from Dry Creek the richest and oldest part of the city glistens in the sun, a stark contrast to the outer slums that rings the main part if the city like mud surrounding a pearl its center piece, the towering metal capitol building. This town is more of a factory with buildings placed upon it, for years the men and women that have worked at these giant factories have built upon it creating a vast working town with hallways and streets that is closer to a labyrinth, any who are unfamiliar with the layout of this large factory town can easily become lost and disoriented. Rigdial is responsible for manufacturing sky ships and weapons as well as much of the other farming and recreational tools used by Argo. The citizens of this town can run back and forth among the twisting passageways and dizzyingly high catwalks blindfolded; only the main road that cuts through the heart of the factories is easy to follow and many visitors do not stray far from it. The people here are more suspicious towards outsiders hardened by the grueling work they must do everyday, but once you have been accepted into their close knit group one will find they are a deeply caring lot that will go to the ends of the earth to help their friends. Vail is the poorest of Argo's towns; its civilians dedicate their life to farming. Whether it be raising live stock or crops the people of Vail do it all, and they do it well. Skilled hunters their food consists mainly of the meat they hunt, often they are hired to take the richer folk on hunting expeditions. Able to catch the rarest and most deadly game these people make a profit by selling their catch to the fancy restaurants in Orium. Although Vail is one of the poorest towns it is also one of the friendliest you will ever find, these people understand hardship and loss and so they can relate too many of the travelers you pass through. A far cry from its name, Dry Creek is located next to the greatest river in the land. With a bustling industry this town is one of the largest, and richest. With easy access to the ocean Dry Creek has many ports, a constant flow of sky ships docking, unloading, and loading cargo can be seen day and night. With one of the largest quarries, lush forests, and great fishing in the area this place has many job opportunities. These are the other locations that are in the encampment. Remember to describe the scene well. A lush jungle located at the base of two giant sand dunes, over time the wind drives sand into the forest covering one side as the dunes move, while more greenery ground in the space left by the second sand dune as it is being moved. Creating a creeping jungle that moves across the desert at a slow crawl. Occupied by the Argo the Sheltered bay is encircled by towering cliffs protecting ships from storms, caves carved into the cliff sides provide cool areas to store goods and people. Large guns are mounted on top of the cliffs to deter attack from pirates and Steva military. After the war only small towns around Shelter bay were left intact, the people here are hardened by the harsh land and the war, a mixture of Argo and Kane people this area is considered by the Government as the home of the barbarians. A high amount of military force occupies this area due to civil unrest and the prison camp located here. An impenetrable fortress Rockfort Prison is a feared prison camp located in the middle of the harshest part of the desert. With no water for miles any who by some Merilee manage to escape are doomed to dye a miserable death. Here is where the Government sends their most dangerous war criminals. Built in the cliffs of Twin Peaks, Twin keep is unreachable from the land bellow. Glistening white stone gleams as the morning sun rises from the south, carved out of the very heart of the mountain these towering buildings, stand out like a jewel in the summer, seeming to completely vanish in the winter save for the human in habitation, fires lanterns, and the constant traffic of traders and villagers as the go about their business. Precarious paths that can be scaled and descended by the natives like mountain goats scale a sheer cliffs that lead down to the farmland bellow that rests on high buttes. A river that carves the main canyon along with the ever present snow provides Twin Keep a constant source of water. Stone bridges link each part of Twin Keep together, the largest part of the city is built on both mountains, smaller houses are carved throughout the cliffs. impressive ports made of stone jut out of the side of the mountain offering safe port for the pirate and trade ships that dock here. Smaller flight craft akin to Earth's jet-skies can be seen flying around the peak. The main canyon that leads to Twin Keep, named Dead lizard canyon because even the beasts born to survive in this dangerous place are easily killed. Cliff Jumpers reside in the tombs the ancient civilization before Steva created, easily seen because of the bright red paint that marks the small buildings, statues, and caves used by this civilization for tombs. high hurricane force winds rage through this canyon, the mountains and its high walls creating a neutral wind tunnel, only the pilots born here and the ones they teach understand how to safely navigation through this canyon. Far bellow a great river called Rainbow River for the many different colors of rock that surrounds it continues to carve away at the earth making the canyon deeper. Small flying machines akin to Earth's jet-ski or speed boat can be constantly seen flying throughout the canyon as Steva military do their patrols and ensure Argo do not attempt to attack. They had small camps made on the sheer cliffs, hidden skilfully from view. The mountain range of Steva, its ultimate protection against enemy forces. The Black Range tower high into the sky, like jagged teeth from an ancient vicious beast these mountain furiously attack the unprepared and unwary with gale force winds and raging snow storms. Not only do the forces of nature attack unskilled captain the reptilian acid spitting gliders know as Cliff Jumpers protect their territory fiercely- attacking anything that trespasses with a heartless merciless barrage from their massive flocks. Carved out of the cliffs, these villages are like impenetrable fortresses only accessible by small hand and foot holds or sky ships. Smaller then Twin Keep these areas are rarely used by the pirates, mostly native people live within their walls harvesting their crops and plants produce by the land. The small lowland area at the end of the Black Range, these cliffs protrude out into the giant river fed by the sea. When one stands on the cliff that points farther out into the water one can see the jagged rocks and small islands. Scouts and lookouts are positioned in the land round about to watch for approaching sky ships. Typhone forest takes up most of the North Western side of Steva, spreading all the way down the hook- a piece of land similar to that of the end of South American that curls toward the land once owned by Kane- up toward the higher plains. The forest is lush and full of life and danger, the trees have grown tall their trunks so thick the eldest of them take five men with arms outstretched to encircle them. Toward the north where the trees end at the sea they are smaller do to typhoons and other great sea storms that give this area its name. A farming village in the Lower plains these men and women are rugged and resourceful. Located near shattered hill these people hunt in its forest and plant in the fertile valley using a complicated irrigation system to draw the water from rivers and glaciers to their crops. Unlike the towns in the mountain range Hothlehay is not built into a mountain, its buildings are a mixture of stone and wood, its walls a ingenious combination of the two that provides a strong defense against fire and rams. Built on a raised part of the valley this village has a 360 view of the valley and forest. invading armies that may have managed to get through the mountains would be seen coming from land and sky long before they reached the village. The expanse of mountains that enclose Hothlehay valley and Shattered Hill named after the giant ape-like creatures that inhabit it. These mountains are precarious but beautiful, not nearly as tall as Twin Peaks our her sister mountains that surround her they still offer protection causing sky ships to have to rise high in the sky to fly over them bringing them into view of the scouts and look outs positioned around the area. A flat expanse of land located just above Hothlehay valley next to the Typhoon forest, the only area and safe passage way into Steva territory this place is mostly used for farmland. it is said that underneath with in the cliffs is where the factory that makes Steva's small sky ships is located. One of the only areas where water meets sand on Steva, Lone beach is located at the bottom of lone Mesa's sheer cliffs. Here there are many caves and tunnels that make up a natural labyrinth, it is said that a factory that produces weapons and sky ships for Steva is located within those caves. The reason this forest is called Firefly Forest is because there are tiny patches of moss that cause little specks of light to be see on the trees. The trees and plants of the forest tend to be the type you would find in a coniferous forest. This is where all the Hunts are held. This is also where most of the hunters find their prey. There are all sorts of animals here, some dangerous and some not, you just have to look in the right place. Rapid River is the main source of water for the humans in Argo. It also is where the most understood herbs grow, they are collected for medicinal and culinary purposes. This water is also full of fish and amphibians, it's a great place for fishing. The river comes down from the mountain fueled by ancient glaciers, winding its way through the land, curving around Orium before passing near the orchard where farms use the supply to fill their irrigation systems and water their crops and trees before making its way out to sea where Dry Creek can be found. It offers a key trade route for Argo allowing people without access to a flying ship to send goods up and down the river between the larger cities. On a small cluster of isles located in the middle of the sea that parts each nation lies a cave known as the Oracular Caverns. A mysterious cave, that shines with magical light and crystals, is said to house an Oracle.A strange woman who never seems to appear the same to the anyone, some see her as a haggled old woman, others a maiden beyond earthly beauty. There is only one thing that they all agree on, she is a woman of great power: one that knows and sees all. Many brave souls have traveled to her island seeking her guidance or to be bestowed a quest. The Stone Lake is a huge lake which is fed by Rapid River. It is bordered by a cliff on two sides which has several caves in the side facing the lake. These are often used as temporary homes for the Rogues that have been pushed away from the encampment. Ancient civilizations also used these caves to bury their dead, these tombs have long since been plundered. The lake is home to many fish but the most animals just visit to get a drink. Located in the land of Old Kane this endless expanse of desert was once inhabited by the people of Kane. But no more, only ruins of mighty cities that were built along a great river, with bones bleached stark white upon the broken roads remain as a reminder of the once great nation. Little water can be found aside from the river people call the Nile after a river said to have existed back on earth. A wide river that curves it way through the desert, old ruins rest beside its banks, rich a fertile its banks are perfect for farming; strangely enough this mighty river never enters Argo territory remaining in unexplored lands. Small huts scattered here and there speak of tiny communities of people who have come to escape the war living here, nomadic groups they are descendents of the Kane nation. These groups manly consist of families, extremely hostile towards strangers they believe are a threat to their existence their skill with Sand Runners is matched by none. The giant span of salt water that separates the nations, protected from the worst storms by the Island of Steva. Sea faring vessels can be seen in large amounts from the faster Sky ships as they follow similar trade routes, this area is the safest place to fly due to the open space with no chances of hitting a mountain or a particularly tall tree. With this advantage also lies a danger, there is nowhere to hide from the forces of Argo only the pirates most skilled in the art of navigation and tactics survive long out here. Soaring through the sky over uncharted territory, be sure to explain surroundings and general location when creating a thread. The Stargazer is a squire topsail schooner , her sails are a beautiful dark maroon soft and warm, mysterious and dangerous; able to blend into the night. Her outer body is a gleaming dark green, painted to look friendly during the day while melting into the darkness during the night. Reinforced by steel the hull is extremely hard to pierce. She is run by a small close knit crew led by a captain who loves her like no other. Most of her hold is dedicated to cargo which can be found full most of time with various things her captain has been paid to hull. Her jobs very and she is faithful through them all. Often referred to as The Ghost, the Stargazer is able to vanish before one's eye due to a very special machine Tray acquired from a deceased friend. Like a chameleon., the Stargazer's captain uses this machine to avoid detection, escape danger, or to surprise an enemy with an attack. Please post your advertisements here, please do not stretch our board with your posts, and be kind and courteous in your advertisements and don't post several times, if you do all adds of your's will be deleted.